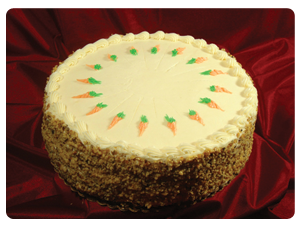 Slices offers a diverse selection of exquisitely designed 12 inch cakes, each serving 16 oversized portions. Call for pricing. Because our cakes are made to order - prepared fresh for pickup - we ask that you grant us 24 hours advanced notice. Orders can be placed at any time through our 24 hour voicemail: (216) 398-0002. PLEASE NOTE: Although we do not do wedding cakes, we do make delicious reception dessert cakes! Call for details: (216) 398-0002.